Also serving communities of Hampton Cove. There are 5 Memory Care Facilities in the Huntsville area, with 4 in Huntsville and 1 nearby. The average cost of memory care in Huntsville is $5,212 per month. This is higher than the national median of $4,650. To help you with your search, browse the 2 reviews below for memory care facilities in Huntsville. Better rated regions include Athens with an average rating of 4.3 out of 5 stars. Caring.com has helped thousands of families find high-quality senior care. To speak with one of our Family Advisors about memory care options and costs in Huntsville, call (855) 863-8283. The busy high-tech city of Huntsville is located in the far north of Alabama near the Tennessee border, and seniors represent 15.2 percent of the city's nearly 200,000 residents. Those people with Alzheimer's disease and dementia-related conditions are well served here: Huntsville has 50 assisted living facilities which provide memory care and there are a total of 62 in the local area. Alabama has been working on a plan to address the memory care needs of seniors throughout the state, where 92,000 people have been diagnosed with Alzheimer's and dementia-related conditions. Long-term care for these residents and others with dementia-related conditions may be in Specialty Care Assisted Living Facilities, or SCALFs which are regulated separately from standard assisted living facilities according to rules established by the State Board of Health. Huntsville has fairly moderate weather which offers seasonal changes but highs and lows which don't drive seniors inside for long stretches of the year. It has a summer high of a humid 89 degrees and winters touching just below freezing at 30 degrees. The city gets about seventeen inches more rain than the national average and only about two inches of snow annually. The air in Huntsville and surrounding Madison County is rated "B" according to the American Lung Association. Seniors with respiratory conditions can relax and enjoy outdoor activities without too much concern about air quality. Huntsville has fairly high crime scores with violent crime rated at 70.1, more than twice the national average of 31.1 and property crime at 63.4, 50 percent higher than the national average of 38.1. Memory care communities keep careful watch over residents, though, with access systems and video coverage to ensure they remain in the controlled environment. Alabama is generally light on the tax burden for seniors, says Kiplinger. Most forms of retirement income aren't subject to state income tax and state property tax doesn't apply for those 65 and over. Sales tax is high, though, averaging over 9 percent across the state. Alabama is one of the few states which applies sales tax to food. Memory Care costs in Huntsville start around $5,212 per month on average, while the nationwide average cost of memory care is $4,799 per month. It’s important to note that memory care rates in Huntsville and the surrounding suburbs can vary widely based on factors such as location, the level of care needed, apartment size and the types of amenities offered at each community. 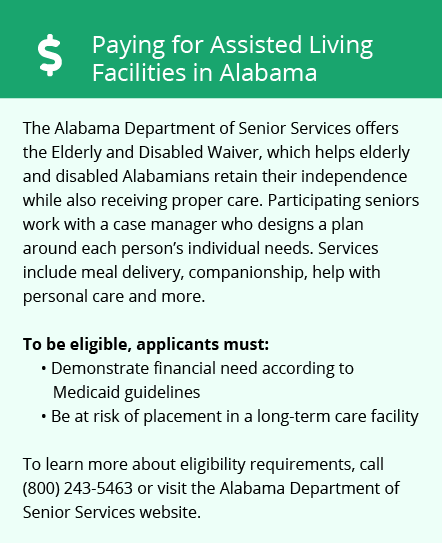 Huntsville and the surrounding area are home to numerous government agencies and non-profit organizations offering help for seniors searching for or currently residing in an assisted living community. These organizations can also provide assistance in a number of other eldercare services such as geriatric care management, elder law advice, estate planning, finding home care and health and wellness programs. To see a list of free memory care resources in Huntsville, please visit our Assisted Living in Alabama page. 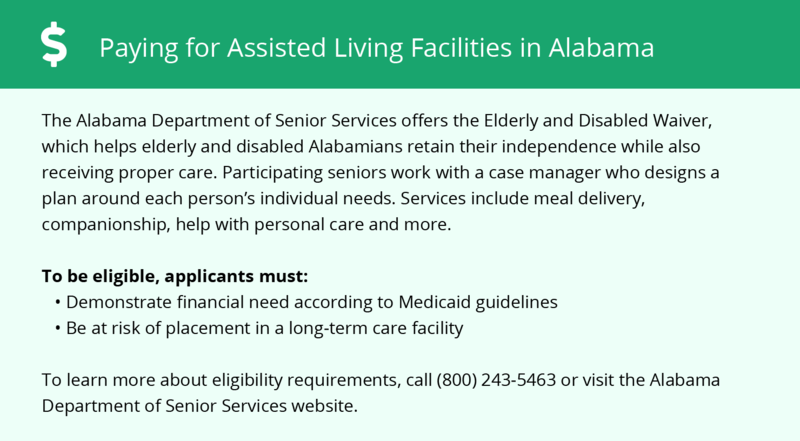 Huntsville-area assisted living communities must adhere to the comprehensive set of state laws and regulations that all assisted living communities in Alabama are required to follow. Visit our Memory Care in Alabama page for more information about these laws.